While we didn't win the Emmy (the honor went to Frontline's incredible "Inheritance") I was fortunate to get to work with my design team at Helios the very next day at POV's Digital Lab. Hosted by the venerable PBS show, the Digital Lab is a hackathon where filmmakers and coders and design folks get together for 48 hours to create and build a new project. My partner Chip Brantely and I are building a companion piece to the episodic podcast "In Fact" that we're currently developing. The idea is for each episode of the podcast to have a standalone interactive documentary component. And Helios graciously decided to join us and do all the heavy lifting! We were thrilled with what we accomplished in such a short amount of time, and we were honored by the other participants with the "Participants Choice Award" at the end of the weekend. It was a great time, and I hope we'll be able to release more about our work soon! Stay tuned! In the meantime, here's the prototype of the first interactive piece called, "The Boat." The whole team behind "After the Storm" was grateful to be nominated for a national News and Documentary Emmy. We're competing in the category of "New Approaches: Documentary," against some fabulous projects by PBS's Frontline, The New York Times, and National Geographic. Wish us luck at the ceremony in NYC come September! We're honored to learn that "After the Storm" was nominated for a Webby in the Best Online Film & Video / Art & Experimental category. In addition, the Webbys gave the piece an Honoree mention in the Best Use of Interactive Video category. The New York Times calls the Webbys "the internet's highest honor," so we're very happy to be recognized, and in great company too! If you're in New York on November 1st, I hope you'll come out to the New School for the Magnum Foundation's "Photography, Expanded" symposium. I'll be there presenting "After the Storm" as a case study along with my co-producer Alex Wittholz from Helios Design Labs. We'll be talking about interactive documentary making and the emerging form. It should be a great event! On the fourth anniversary of the monster tornado that ripped through Tuscaloosa, Alabama, I'm really excited to present the interactive documentary project "After the Storm." Produced with Helios Design Labs out of Toronto and funded by ITVS, this interactive doc is a kind of hybrid lyric essay. It was a delight to work with Independent Lens and the Post, and I'm thrilled that the project is being seen by so many people. Here's the Independent Lens page, and here's a Q&A with me about producing the piece. Oh, and here's a Q&A between me and the designers talking about the challenges and the excitement of working on a piece like this. You can experience the piece for yourself here. It's optimized for modern browsers (Chrome or Safari is best) but a streamlined version with less navigability is available for mobile and older platforms. A recent short I produced with Chip Brantley and a few of our students has been picked up by the New York Times as part of their Op-Docs series. We were thrilled to share Clark Olsen's story and felt deeply honored by how much he let us into his life. Be sure to check it out if you haven't already! "After the Storm," my interactive documentary/essay hybrid is coming to SXSW in March! I'm excited to have a formal release of the project tied to a panel I'm leading entitled "Tool Kit for Crafting an Interactive Documentary." With Cathy Fischer, our production manager from ITVS, and Mike Robbins and Alex Wittholz, my incredible graphic and web-design team from Helios Desing Labs in Toronto, we'll be talking about the development of the project and the ways that filmmakers and techonologists can become full collaborators. If you're in Austin, buy us a beer! Also, check out our teaser for the project here. This website will have more launch details as we get prepared to release the project. "Eating Alabama" honored by national James Beard Award! We were thrilled to learn that "Eating Alabama" has just won the James Beard Award for Best Documentary! The JBF Awards honor not only great restaurants and restaurantuers, but also broadcast media in print, television and film. Glad to be among such a distinguished group of nominees and winners! We were very pleased to learn last week that "The Durrs of Montgomery" picked up three Emmys in Atlanta during the Southeastern Regional Emmy Awards. The film was nominated in four categories - photography, editing, sound design and Best Historical Documentary. The only place we got robbed was in the photography category - and it was indeed a robbery, since Justin's work on the movie was really beautiful. But a hardy congrats to Nick Punch (audio) and Paul Rogers (editing). If you haven't seen the film, you can watch it for free on APT's Vimeo channel here. I like to think that Virginia would be pleased. That's my favorite picture of her, sitting in the den at Pea Level, regaling some visitor with stories and theories and admonishments. On the road and in the edit suite. 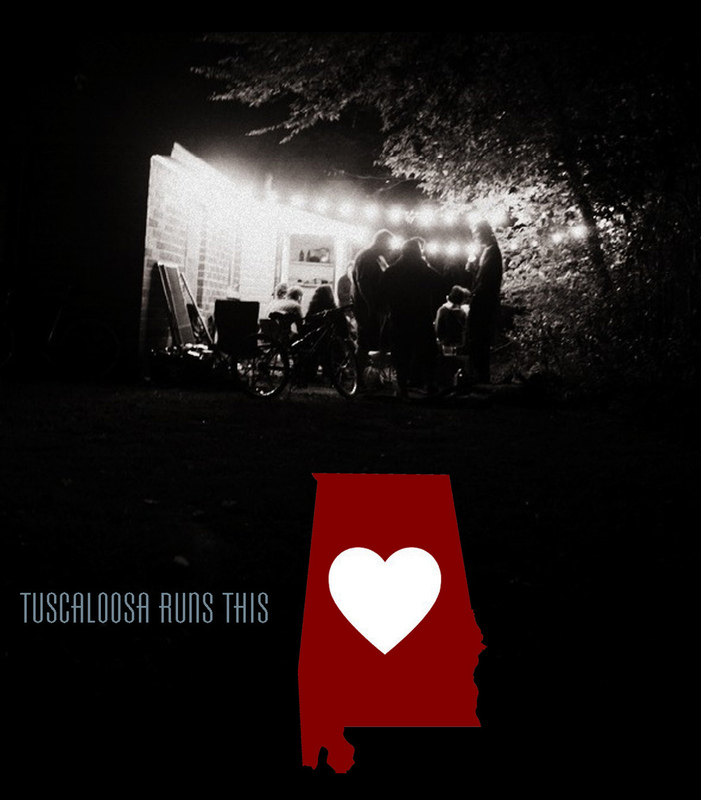 "Eating Alabama" has been making the film festival circuit rounds for the past year. It's been great to share the movie with different audiences throughout the country. We've picked up some great reviews and some awards too! Check out the "Eating Alabama" website to see more and read about our various screenings. But it wasn't just screening the film that dominated last year - I also finished shooting and editing "The Durrs of Montgomery" for Alabama Public Television. The crew and I delivered the movie in June and it's been playing regularly on APT. We had a wonderful screening of the film at the Capri in Montgomery, with lots of Cliff and Virginia's friends in attendance. And I shared the film with the Southern Historical Association Conference too back in November. You can watch the entire movie for free on Vimeo! Next up I'll be working on the interactive documentary "After the Storm" for ITVS Interactive. And I'll have an announcement in the coming months about the next feature documentary project. Suffice it to say, I'm getting very excited about starting another film. And, if the movies weren't enough, I've started another class at UA called "Anatomy of a Trial." We're soliciting applications from UA students and will begin teaching in the fall. Stay tuned for more info about that one, too! I'm very pleased to announce that "Eating Alabama" will finally have its world premiere at the SXSW Film Festival in Austin in March! Four years in the making, I don't know that I had a very good idea of what this day would feel like. But now that it's finally here, I'm thrilled! I have to keep this feeling in mind when I'm in the middle of those dark nights of the soul making a film... Hope to see you in Austin! 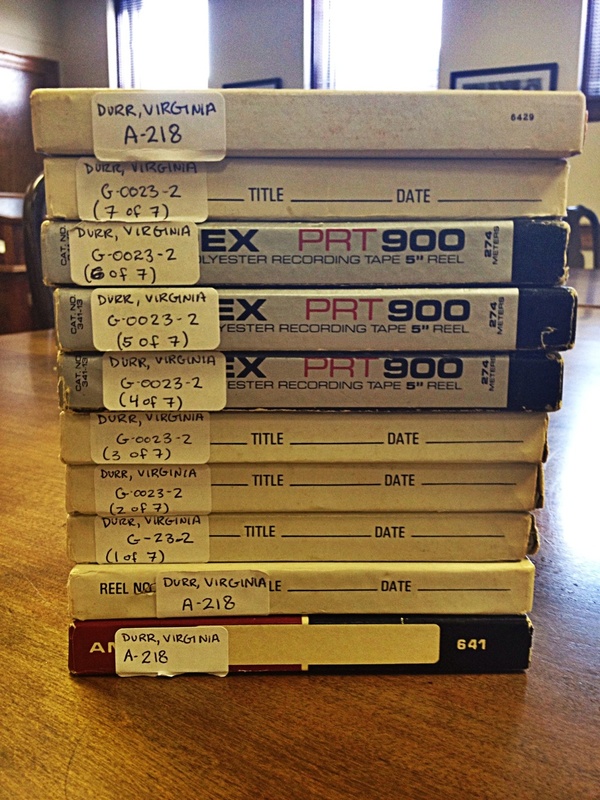 I'm busy working on a documentary about the lives of Clifford and Virginia Durr for Alabama Public Television. In the past few months, my cinematographer Justin Gaar and I have traveled around the south to film interviews with a variety of Southern historians. The story of the Durrs is a remarkable one, and I'm excited to be working on a film about such principled and admirable Southerners. They represent a kind of transformation narrative that has all the hallmarks of an engaging and emotional drama. It's likely that you've never heard of the Durrs, so if you're interested you can read Cliff's Wikipedia entry here and Virginia's here. Tearing apart a hotel room for the interview... The legal historian Laura Edwards at her home in Chapel Hill. The dean of Southern history, Dan Carter, at his home outside Brevard, North Carolina. I've been working on a new interactive documentary about the aftermath of the April 27th Tornados with a group of former students. We're gathering stories from residents across the city to tell an inteweaving narrative about what happens after the storm. We're interested in following the story for a few years before releasing what I believe will be an innovate new kind of documentary. We'll be working with the new media firm Bombay Flying Club to help develop the site, and I've secured development funding from ITVS Interactive to help us along. We hope to release the project in April of 2013, 2 years after the storm. In the meantime, we're using a simple blogger site to release some of the early character pieces. I've posted the first four below. I'm very honored to have a piece in a new anthology of Alabama writers writing about the tornado that passed through Tuscaloosa two weeks ago. I hope you'll read and donate. More about the storm and the rebirth of our city in the coming weeks, when we've had a chance to figure it out a little more. Below is a photo Bartly took of me working with my interminable stack of index cards - representing scenes, themes, narration, stills, etc. Documentary editing can sometimes be like trying to solve a huge jigsaw puzzle. You've got all (or most) of the pieces, but for them to tell the most affecting story, you've got to arrange them just right. It's a long and sometimes agonizing process, but it's ultimately rewarding to see it all coming together. Still shooting a lot here in the thick of the Alabama summer. Here are a few stills from the past few weeks. 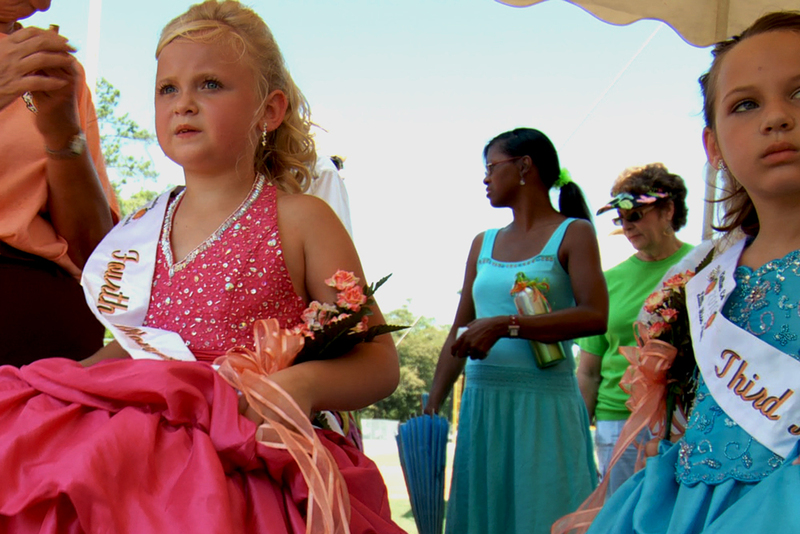 Little Miss Peach contestants wait at the Peach Auction in Chilton County. Nathan Thompson in Cullman shows me one of his six chicken houses. 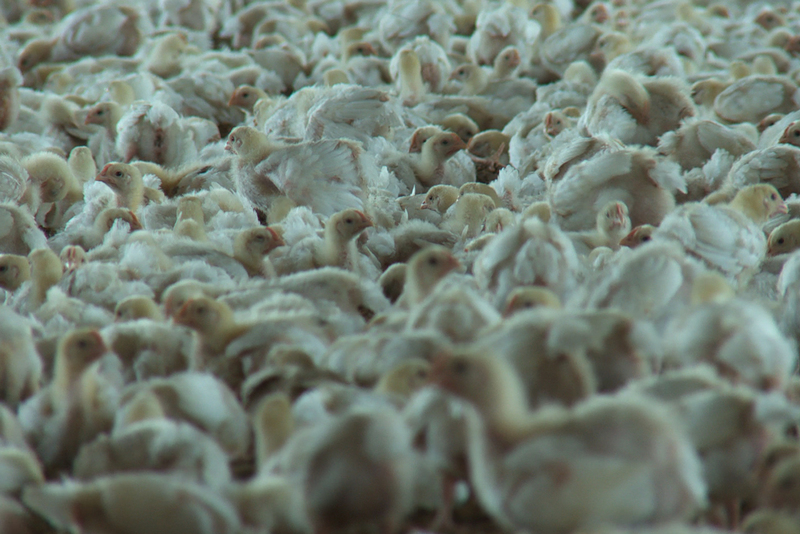 Future McNuggets. Charlie, at Jones Valley Urban Farm, doing what an urban farmer does: digging up slabs of concrete. 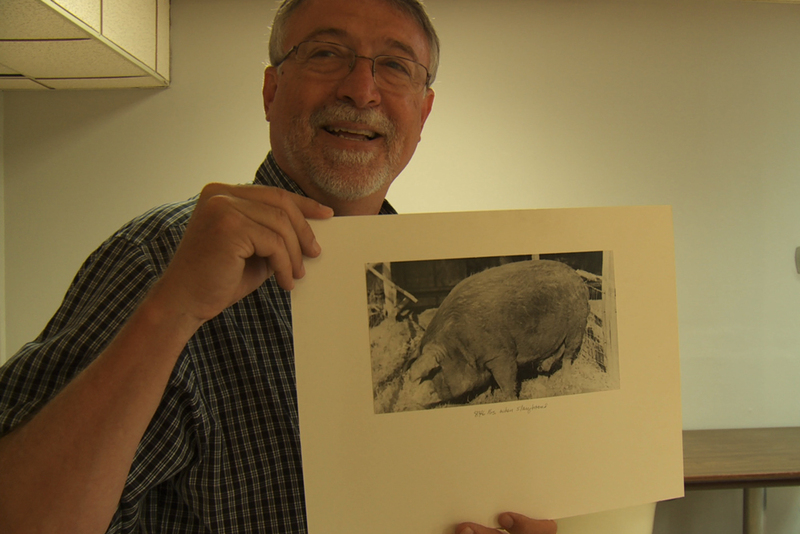 Steve Davis, historian at Bryce Hospital, shows off a picture of a prize winning pig from the Bryce farms. 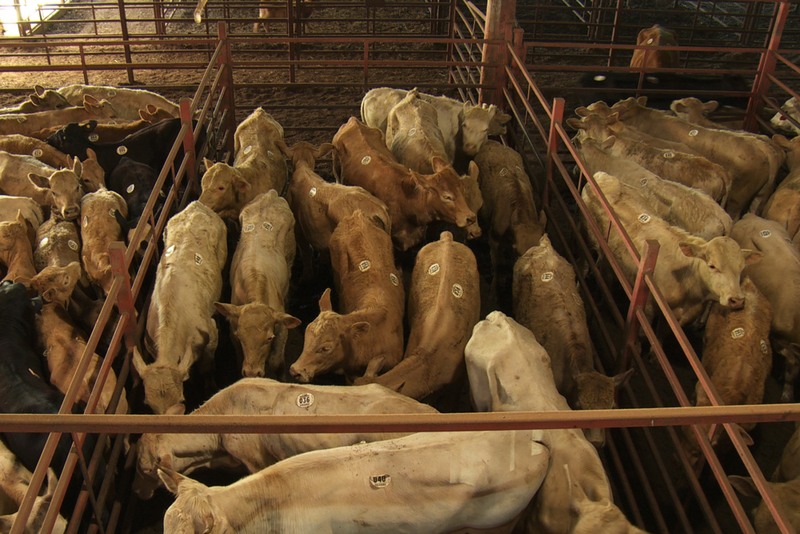 Weight at slaughter: 846 pounds. 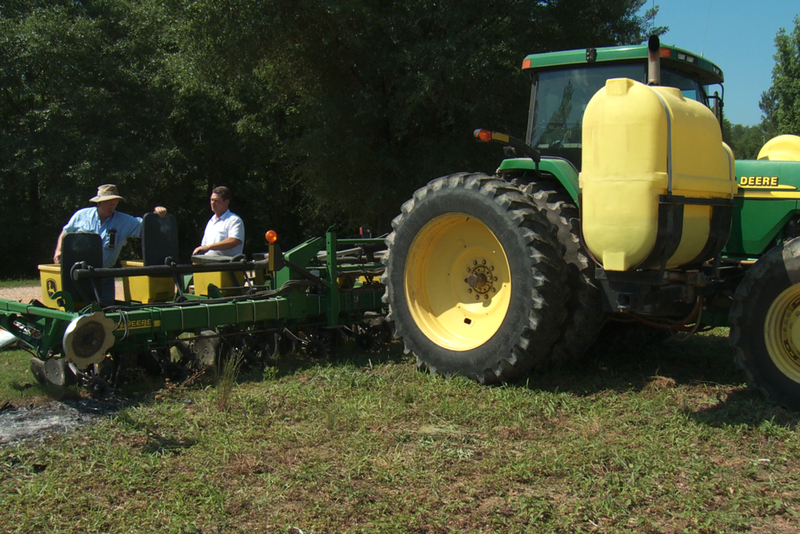 At the Walker's farm in northern Tuscaloosa County planting Roundup Ready soybeans. David Snow picking Swiss Chard out at Snow's Bend in Coker. 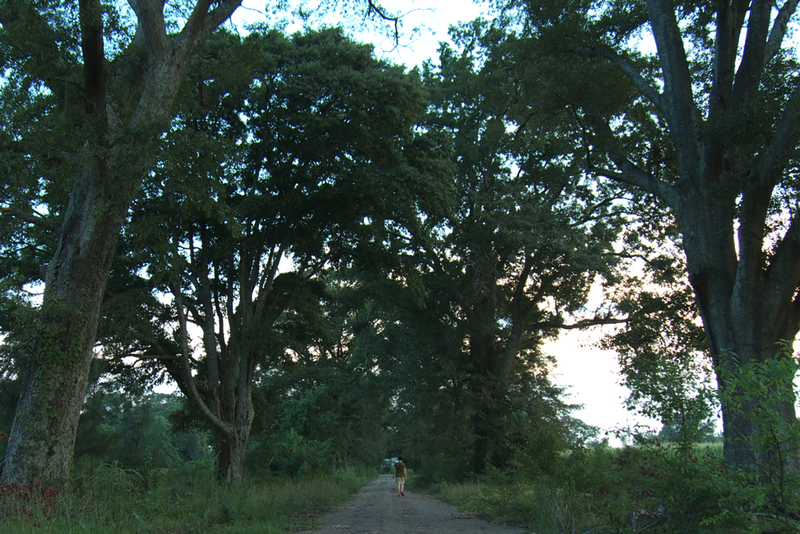 The road leading to the Colony (commonly called "Old Bryce") where there used to be a huge sustainable farm. 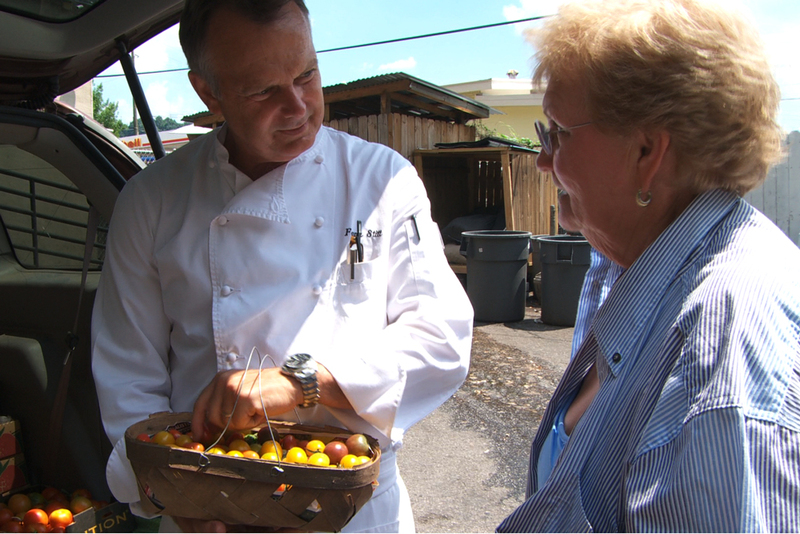 Frank Stitt recieves delivery of heirloom tomatoes for Bottega and Highlands. The weekly cattle auction at the Moulton Stockyard. The outgoing 2009 Miss Peach and her court take their final bow at the 2010 Miss Peach Pageant in Chilton County.